So what about when the fight happens between an alien who's virtually indestructible and a mega brooding billionaire with mommy issues? You get a great idea for a summer blockbuster, that's what! Well, that, and the world gets thrown into peril. But it's cool. These guys will totally figure out their issues before things go too far, right? In the meantime, have you picked a side? Do you see the world through a black-molded mask of skepticism or are you ready to protect the world at nauseatingly didactic costs? If you're the former, you're probably a Batman fan, and this costume might just be perfect for you and your family. This costume is officially licensed and straight from the movie. It's 100% polyester fabric with polyurethane foam. 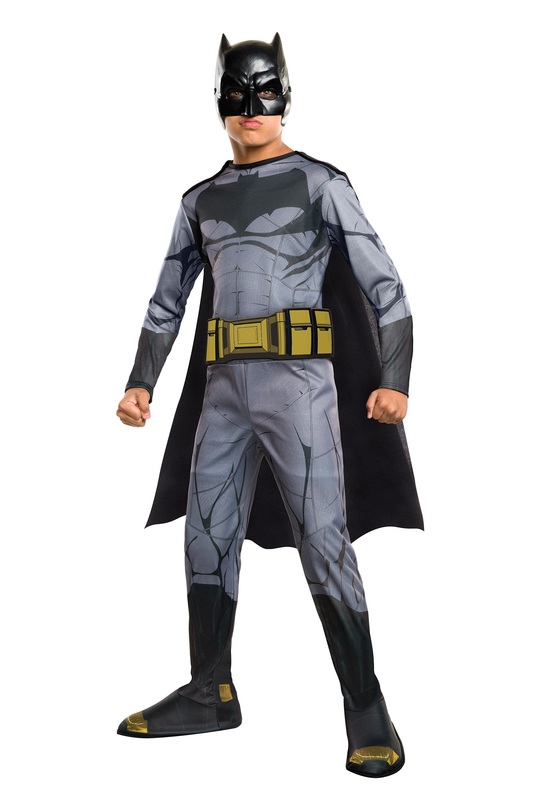 The jumpsuit fastens with Velcro in the back, along with the cape. It has a printed foam belt with fabric waist ties. It also comes with a molded plastic mask that covers the upper half of the face, and attached foam boot covers with elastic bands under the foot.